Another recipe that I have been making since the beginning of time, this is based on one from the Time Life “Foods of the World” series. 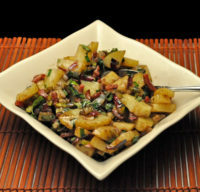 This is a simple salad, slightly reminiscent of old-fashioned German Potato Salad. 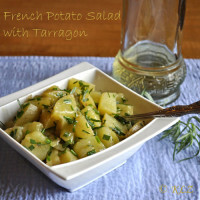 Normally, when I make potato salad, or any kind of ‘picnic’ salad, I make lots so we have leftovers for a few days. 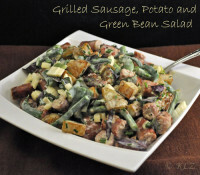 Our favorite main course salad is grilled sausages, potatoes, lettuce and goat cheese. 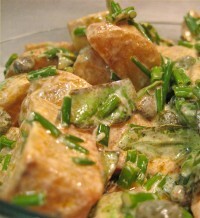 This is my favorite potato salad…..
Do you recognize a pattern? 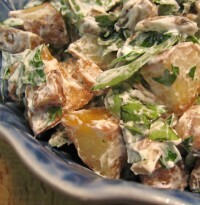 The potato salad I grew up with was made with boiled potatoes and mayonnaise (traditional American Potato Salad). I read in the car…. It’s the only time I really have to read magazines. The other day, on our way to the canal for a bike ride, I was flipping through the August issue of Cooking Light. This completes our cold dinner menu: Melon with Dry-cured Ham (no recipe required), Salmon Chaud-Froid, Green Bean and Basil Salad and French Potato Salad. 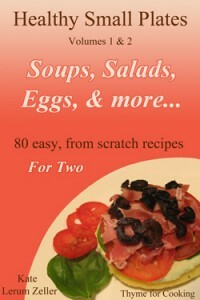 There are many, many recipes for potato salad – French, German, American. 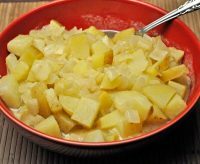 Traditional American Potato Salad, at least the Mid-Western version I grew up with, has, like so many classics of cuisines around the world, as many iterations as there are cooks. We did something today that we haven't done in ages…. Or ever, actually. We forced the puppies into the back of the car and went on an outing. They haven't been in the car since they were spayed last fall…. Ever jump out of bed, salivating with the thought of hot sticky, barbecued ribs for lunch, get to the kitchen, start whipping up the sauce…. And discover that first you have to go out to the barn and butcher the pig? My last post, about walking in the mountains in Andorra, brought back a lot of memories about that small Principality. Andorra has been an independent country since 917 (I think that’s the right date), well over 1,000 years.